This 47" outdoor wet erase marker sign frame comes complete with a 4-color pen set that creates brilliant signage that won't wash off in rain. 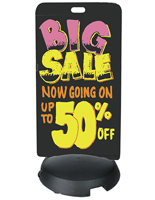 Each 24x47 double-sided sandwich board has a white backer with a cut-out handle for carrying. The portable outdoor wet erase marker sign frame also includes a weighted base that can be filled with water or sand for stability and features hidden wheels. 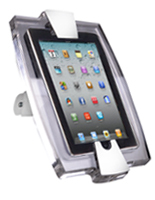 This type of double-sided fixture is perfect for creating advertisements for retail stores, restaurants and events. The tall, thin sign frame set includes markers that will not wash off in rain, making this weighted fixture safe for use in inclement weather. The hidden wheels allow the signboard to be moved easily between locations even when weighted with sand or water. Please note: The included markers are designed to not wash off in rain and will wash off when wiped with Windex™ that includes amonia D.